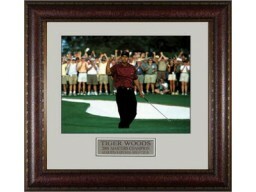 Tiger Woods achievements to date rank him among the most successful golfers of all time. He was the highest-paid professional athlete in 2008, having earned an estimated 110 million from winnings and endorsements. 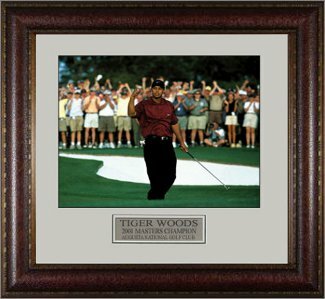 This is an unsigned 16X20 photograph of Tiger Woods doing his famous "Fist Pump" on the way to victory at the 2001 Masters at Augusta National. Custom Leather Framed and Premium Matted as shown.